that would take us off of FOB Salerno for the final time. Of the thousands of phrases that are used to describe life in the military, I would have to argue that "hurry up and wait" is hands-down, without a question- one of the most appropriate descriptions a tongue could speak in an effort to capture the feelings of so many in uniform. Traveling via the military transportation network is also quite a humbling experience. With no first-class seats or in-flight movies, you quickly learn that you are just another number, a small star in the enormous galaxy that is military movement. If you'll recall my first post to this blog, back in October of 2010, I detailed how I had been chosen as the "pallet rider" for our team's movement in and out of Afghanistan. Although it took me 28 days to get the cargo over there, the kind folks in our command decided that I was as capable as anyone else to shepherd the goods back towards US soil on the return trip. 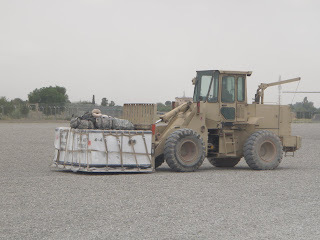 In an effort to ensure that the shipment arrived Camp Atterbury in advance of the rest of the team, a decision to send the cargo and myself up to four weeks in advance was made. Accompanying me and the pallets would also be Sergeant Matt Williams, a broad-shouldered, square-jawed (nicknames include Buzz Lightyear and/or GI Joe) soldier from the Muncie area. Matt actually managed to tear his meniscus several months ago, limiting his mobility and combat capabilities to an extent that it was determined he should be sent home early for a closer examination. A former high school football stand-out as linebacker, Matt has a history of knee injuries. With the Fall semester beginning at Ball State University on August 22nd, Matt is anxious to return and start a treatment plan before he goes back to school in pursuit of his degree in Exercise Science. If a surgery of sorts is indeed warranted, he and his wife Lacy are going to have a busy couple of weeks as he completes the required redeployment procedures at Camp Atterbury in addition to whatever type of rehabilitation he is prescribed. When we finally got the word that our bird was in-bound, a mood of cautious optimism began to fill the air. We'd been told that before, but this time it seemed like all of the stars had finally aligned. Even as we walked out to the runway in hopes of boarding the plane, we were careful not to get our hopes up too much. After all, the night prior we had been in the same position and ultimately turned away as the aircraft had been designated as a medical evacuation flight at the last minute. But this time it was for real, Matt and I were finally taking off from Salerno. The flight that came in was actually a cargo plane designed specifically for moving cargo in and out of smaller bases just like Salerno. A C-130 operated by Air National Guardsman from Niagra Falls, the six small seats burrowed into depths of the fuselage looked very welcoming. As we climbed aboard, the pilot stopped Matt and offered him a seat up in the jumpseat of the cockpit- a great sign that things were finally starting to go our way. As I sat there strapped into the cargo-net framed seats, a sigh of relief that could probably be heard back in Indiana came out as the first pallet they loaded into the aircraft was that high maintenance sensitive piece that had already claimed two good nights of sleep from the both of us. After an uneventful flight (that's always a good thing in this part of the world), I have to say it has never felt so good to step foot on Bagram Air Base. For brevity's sake, I'll refrain from going into detail regarding the many complications our cargo was faced with upon arriving at Bagram. A long story short, even in today's world of advanced computing, there are definitely still some serious communication issues between the Army and Air Force. In this very blog, I have raved about advances made in joint operations over the years, those advances must be operating in a vacuum far outside the world of cargo movement. One member of the 3-19th Agribusiness Development Team, Sergeant First Class Tom Johnson, has had the unenviable task of operating as the unit's liaison officer at Bagram Air Base over the last year. In this role, Tom was responsible for facilitating the movement of each and every team member's travel in and out of Bagram for our individual leave periods. While the travel coordination portion is the most visible part of Tom's job at Bagram, he is one busy-bee as he also handles countless other issues around Bagram for members of the Indiana National Guard and beyond. It seems that each additional visit I make to Bagram, the more I enjoy my time there. Perhaps this visit was cloaked by a sense of completion, who knows. During this stay, I made sure to coordinate sleeping arrangements through the Media Operations Center again as we did during a visit there in May. The only other sleeping option was in tents, not an ideal situation when the average daily mercury reading sits between 106-108 degrees Fahrenheit. 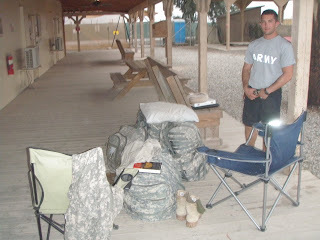 According to the original travel itinerary, we planned on spending four or five days on Bagram. Due to the complications previously mentioned, we quickly learned that there wasn't a chance in Haiti that we'd be flying out anywhere near our scheduled departure date. While we did feel like we were beginning to overstay our welcome at the Hotel California, the staff at the Media Center were extremely hospitable over our entire nine day stay. They knew all too well the joys and frustrations of military travel and were happy to accommodate. 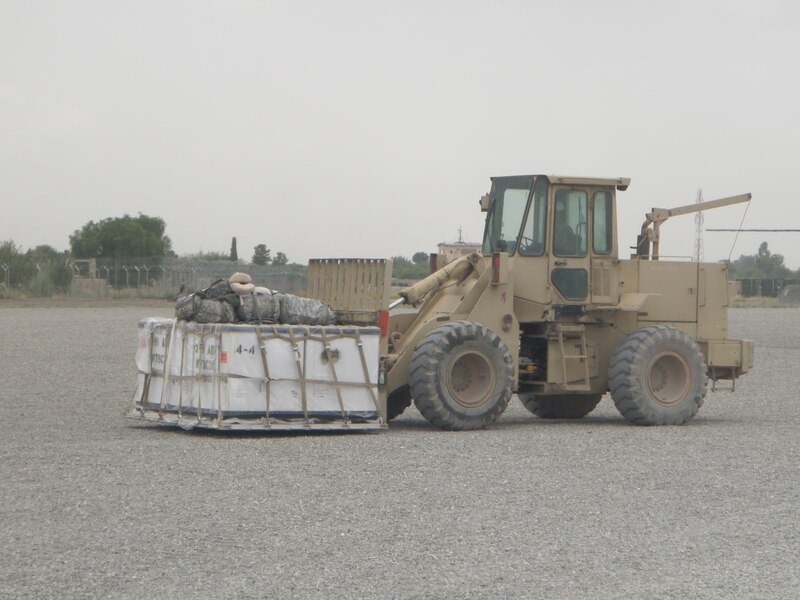 Aside from the high temperatures and seemingly daily dust storms, the low humidity found on Bagram was a welcomed relief to those of us who were used to Salerno's muggy days. 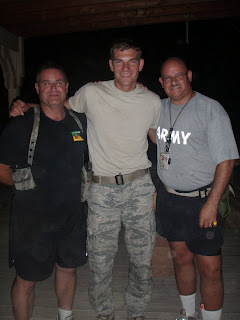 Our time on Bagram actually flew by as we kept quite stringent schedules. Personally, I took the opportunity to enjoy a few long runs, write a few blog updates, read Tim Russert's book Big Russ & Me (a great read for any son), and also enjoy a little more variety in dinner options offered between the base's seven different dining halls. On our first evening on Bagam, Saturday the 16th, we noticed a large crowd gathered near one of the activity tents. As we walked closer, the Air Force Tops in Blue came in to focus on the stage. After six months months on a "black-out" FOB, where noise and light discipline are practiced after dusk, live music was a much-welcomed sound. I've heard this group of talented Airmen in the past, but have to say that their patriotic-themed set and songs took on a whole new meaning while listening to them in a war zone. Much as in the States, Saturdays must be a great day for live music on Bagram. This past Saturday, while again walking home from dinner, we noticed the faint sound of a saxophone in the distance. Fortunately, at Matt's urging, we set off to explore and hunt down where this music was coming from. After a few minutes of navigating the maze of b-huts scattered across Bagram's bowels, we were led into a courtyard setting deep within the Coalition Village. Shockingly enough, the first person to greet us as we entered the area was a familiar face- Major Ducrocq, one of the French soldiers that I had met several months earlier during another visit to Bagram. Apparently the French host a sort of Saturday social each week at the "Talibanned Tavern", a small wooden hut with more war memorabilia than the Smithsonian. This week, they just so happened to be featuring Espresso 57, a jazz component of the 1st Cavalry Division Band. While the scene lacked a few of the critical components (booze and Ingrid Bergman) that brought fame to "Rick's Cafe" in the movie Casablanca, I couldn't help but think of how GI's must have felt after spending an evening listening to great music and of course in honor of Humphrey Bogart- enjoying a fine cigar. Monday July 25th, our ninth day at Bagram, started off with an alarming phone call. Just as a parent must feel when the phone rings during a sound night's sleep, this was not the call I was looking forward to waking up to. Apparently in the course of the last few days, in the hustle and bustle that is cargo movement at Bagram, the four pallets that we were assigned to travel with had taken off without us and were now sitting Dover, Delaware. The issue of the sensitive pallet isn't quite as concerning now that the goods are back on US soil. If anything, I think the strongest feelings were that of frustration, after learning that we too could have accompanied the cargo and most likely would be nearing Indiana by this time. 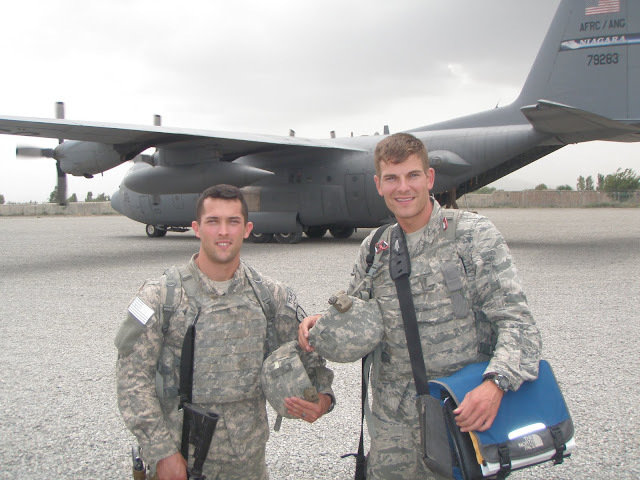 In an effort to "catch-up" with the cargo, we were sent to the Bagram Airport in an effort to obtain the first available flight out of Afghanistan. Within eight hours, we were on a C-17 bound for an "undisclosed location in SW Asia" as the military refers to this particular installation. Upon touching down at this location, a particularly rough landing resulted in the foot peg of a gurney-type stretcher (3 foot long piece of titanium) giving me my first official welcome to the country. Fortunately the blow to the top of my head didn't knock me out or require stitches- although it definitely woke me up after my in-flight nap. Within minutes of arriving to my current location (that's how I'll refer to it from here on out as opposed to typing an "undisclosed location in SW Asia" each time) it was apparent that my complications were far from over. Apparently, in the haste of rushing us out of Afghanistan, the necessary paperwork for my "release from theater" and "authorization for movement" had not been properly documented. Although I was hand-carrying all the required documents, this was still not sufficient for the kind young Airman I was now faced with and I was told that a "deviation" to my orders must be completed, a process she claimed could take "several days". 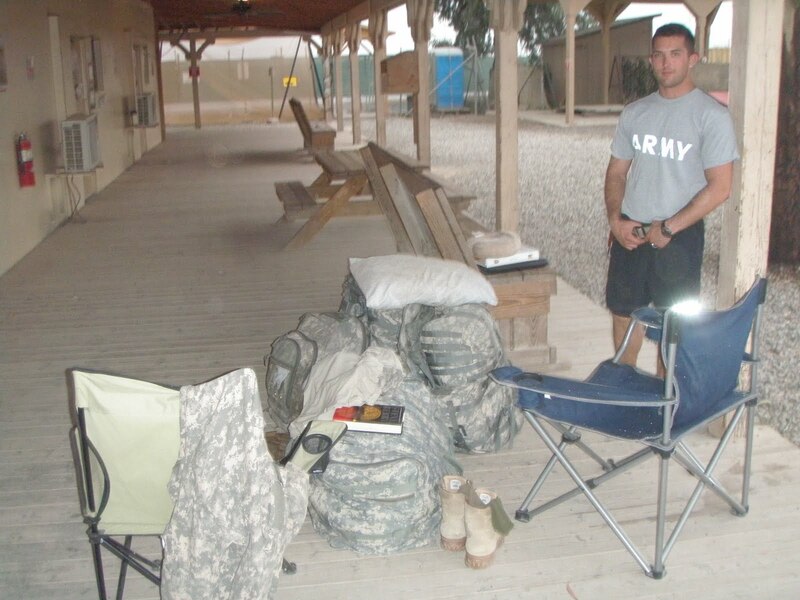 As for Matt, I think the rigors of traveling in and out of Bagram, loaded down with several hundred pounds of luggage each, took their toll on his ailing knee. By Tuesday, our first full day on ground here at my currently location, he was limping around considerably. With temperatures nearing 120 degrees here each day and a 10 or 15 minute walk necessary to access any of the bases many amenities, we both decided it was best for Matt to head for the US on his own. Because Matt is an Army soldier, traveling under a different type of "order" per se, he was authorized to leave while I was forced to watch him board his plane bound for the Glory Land. Great story! Thanks for sharing with us. Will you be able to reveal the secret location once you're home, or will that be left to our imaginations? Good luck on the rest of your trip.